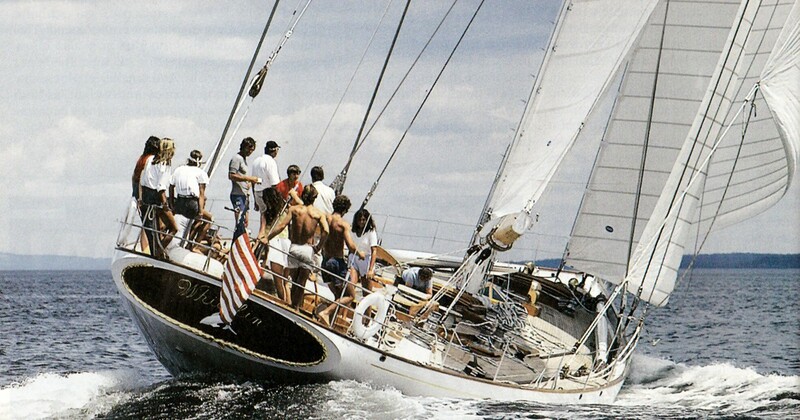 Classic sailing yacht WHITEFIN is a Bruce King design and was built in 1983 by Renaissance Yachts of Maine, USA. 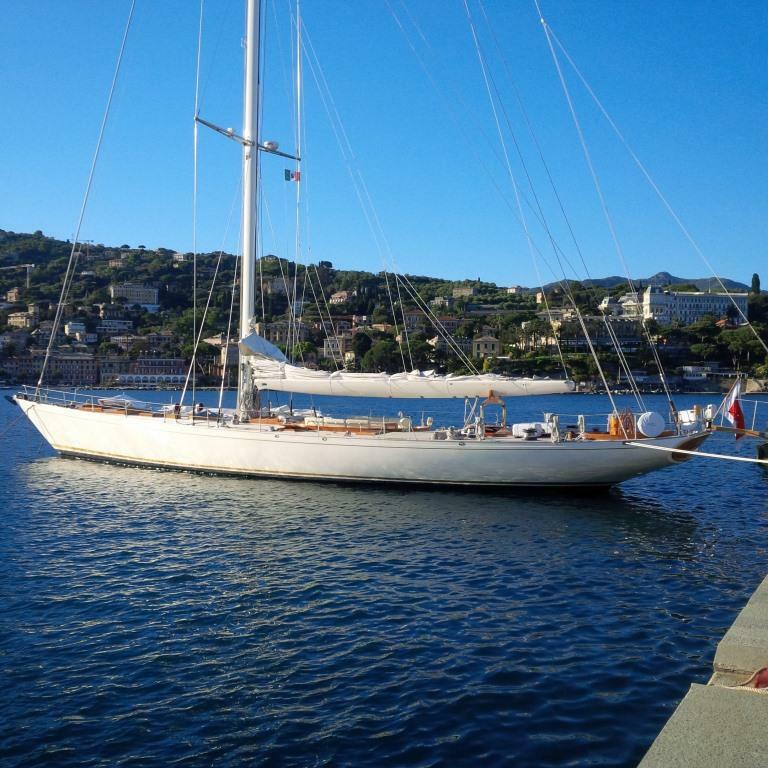 Measuring 27,43m (90ft), S/Y WHITEFIN embodies an era of gentlemanly yachting, while boasting state of the art technologies, thanks to an extensive refit in 2015. 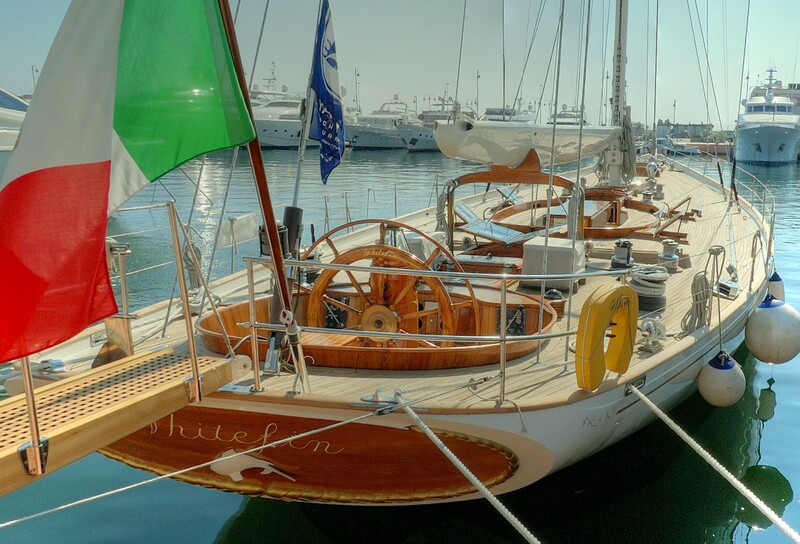 The stunning sailing yacht WHITEFIN offers elegant and traditional accommodation for up to 8 charter guests, in 4 cabins. 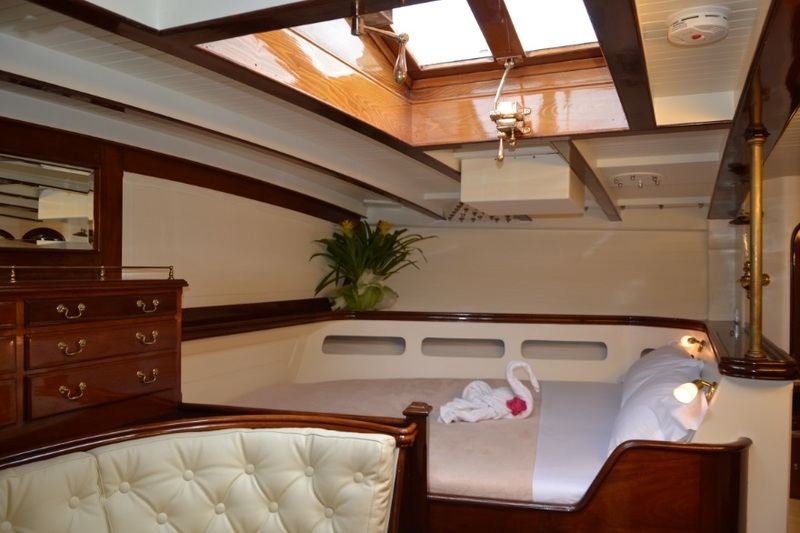 Crewed charter yacht WHITEFIN’s stylish interiors have retained their originality and elegance, from the high gloss cherry wood panels, classic soft furnishings and exquisite attention to detail. 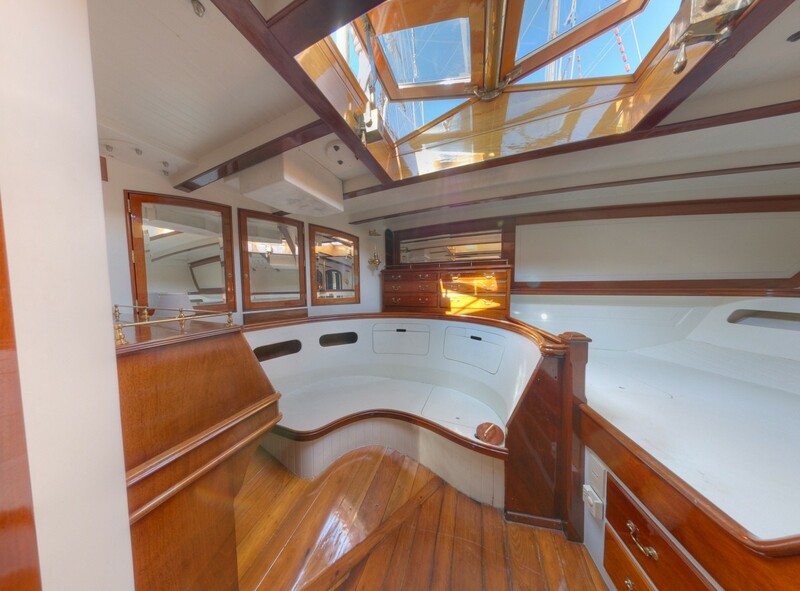 Throughout the yacht, full beams run the width of the deckhead, while raised skylights provide ample natural light. 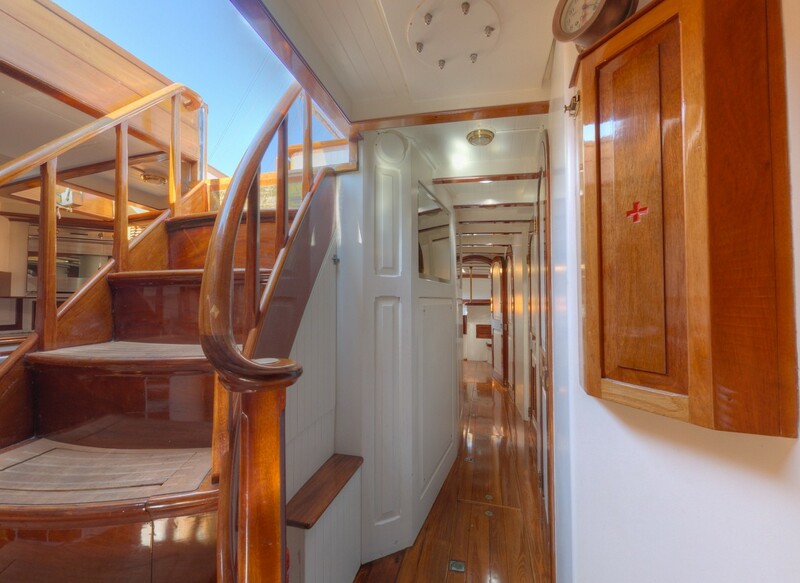 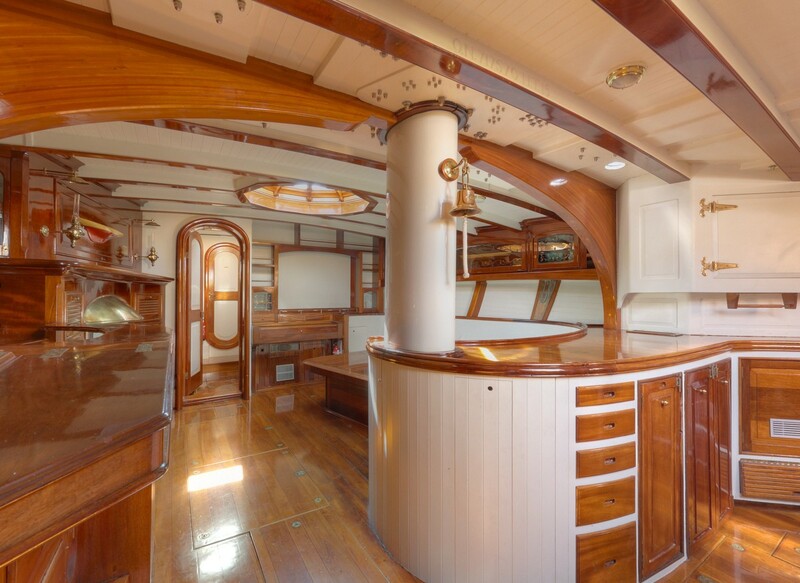 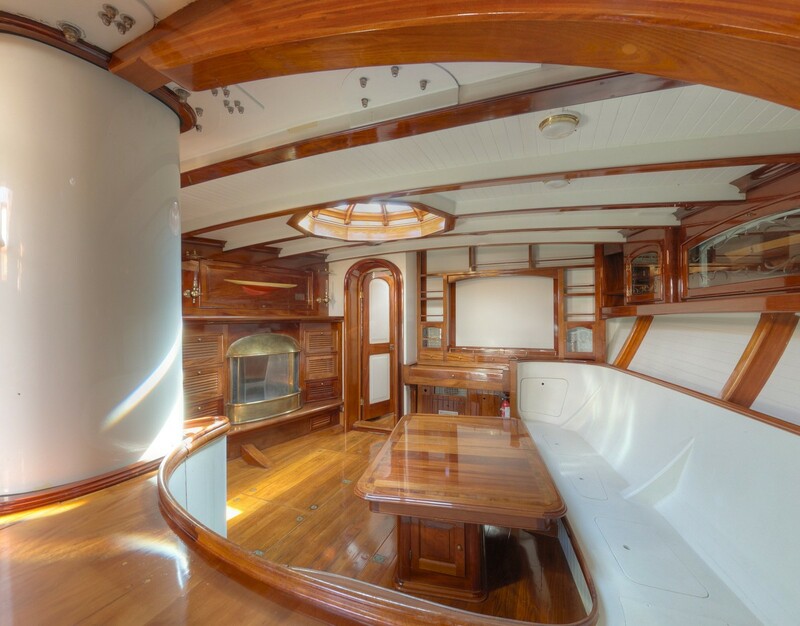 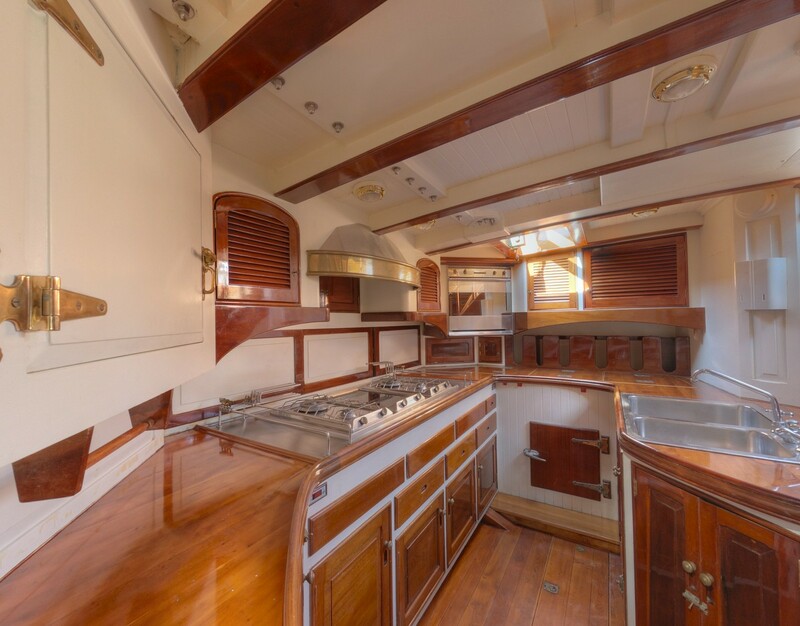 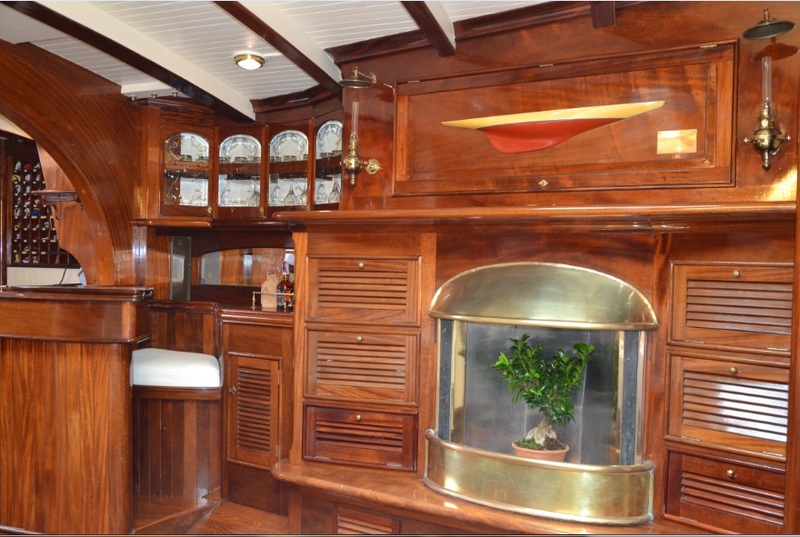 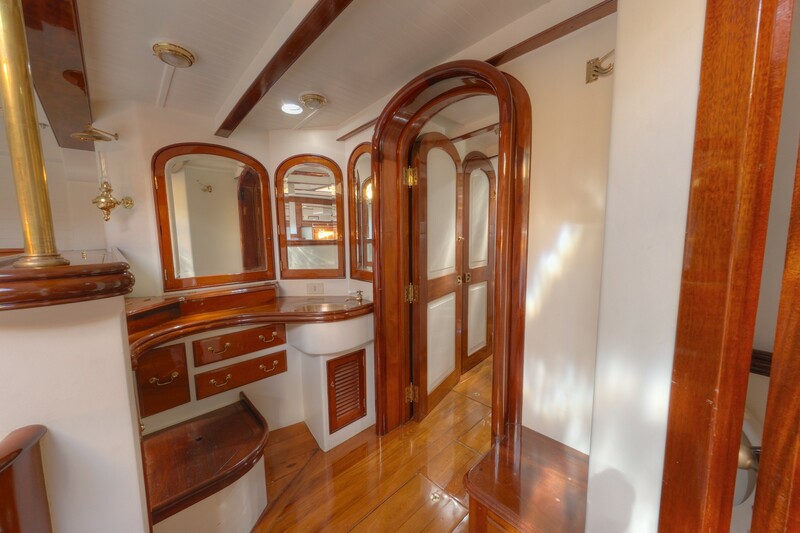 Descending the beautifully finished sweeping companionway, a fully equipped galley is to starboard, with the navigation station to port. 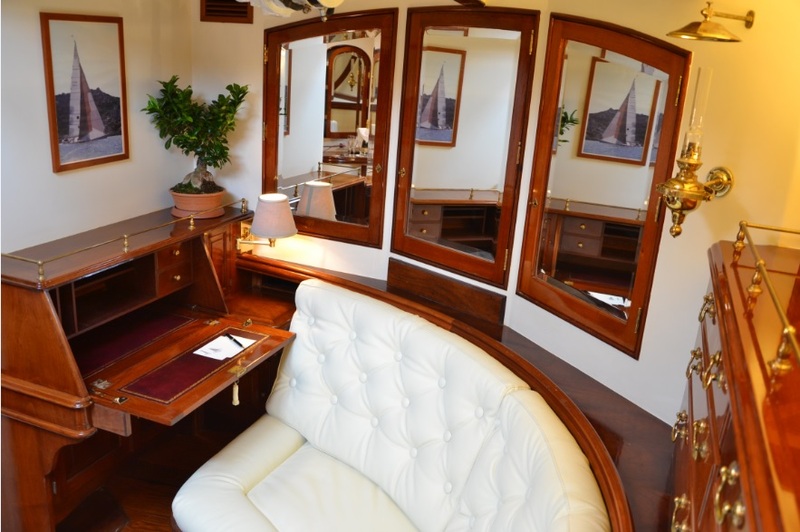 Forward, through a gently arched masterpiece of joinery, is the salon set in an open plan, featuring a formal dining area, integrated with a comfortable lounge, Piano, library and TV entertainment. 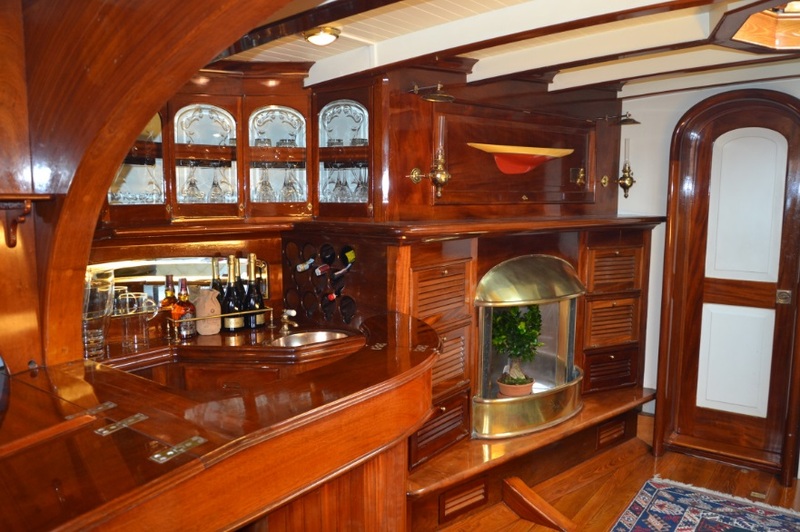 On the port side of the salon are an opposing fireplace and complete wet bar. 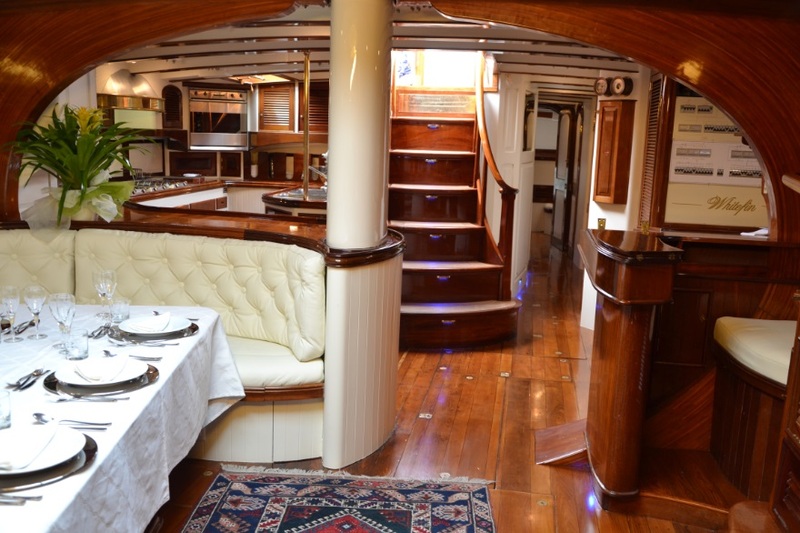 Guest accommodation is aft of the salon, in 1 master cabin, 1 double cabin and 2 twin bunk cabins. 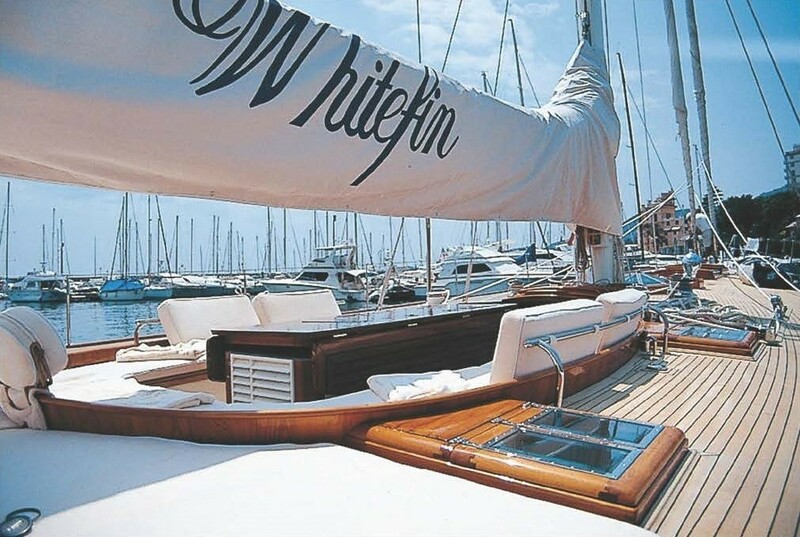 S/Y WHITEFIN is fully air-conditioned throughout. 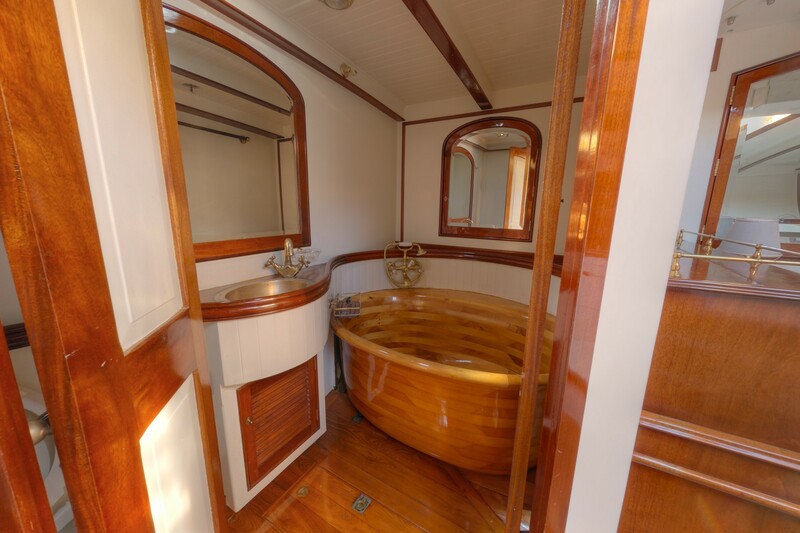 The crew have separate quarters forward, offering optimum guest privacy. 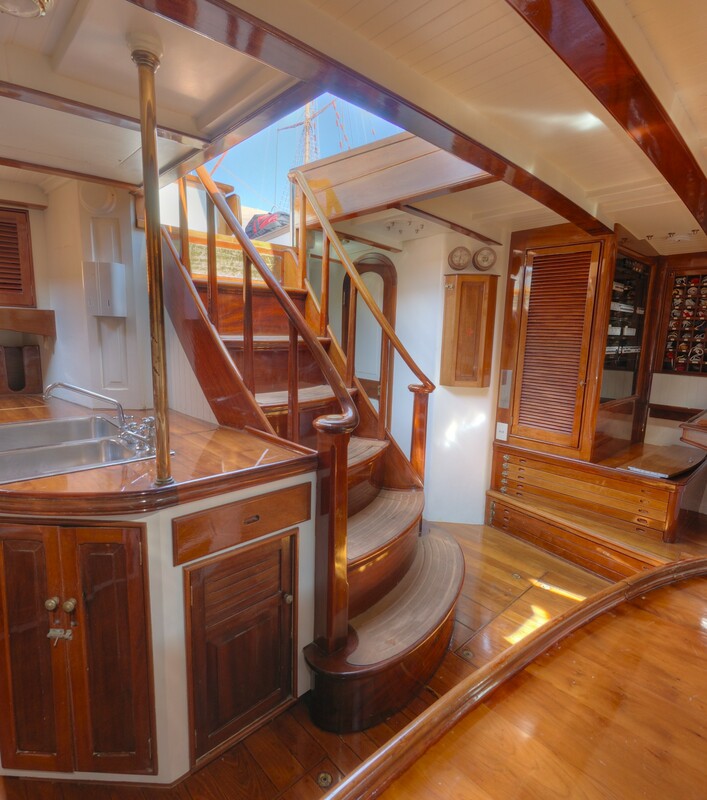 Aboard the Renaissance Yacht WHITEFIN, there is plenty of exterior living to relax on her luscious teak decks. 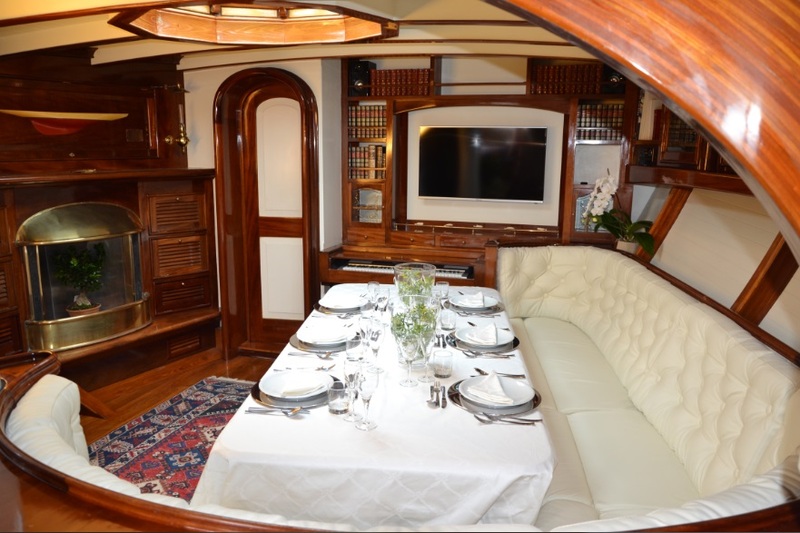 A guest cockpit features a large oval seating area and alfresco dining table, perfect for elegant evening meals and relaxing throughout the day. 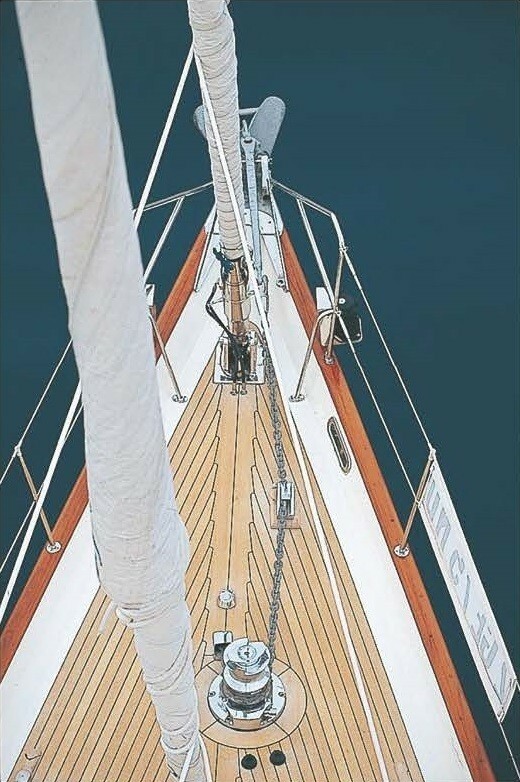 The helm is aft with a recessed cockpit. 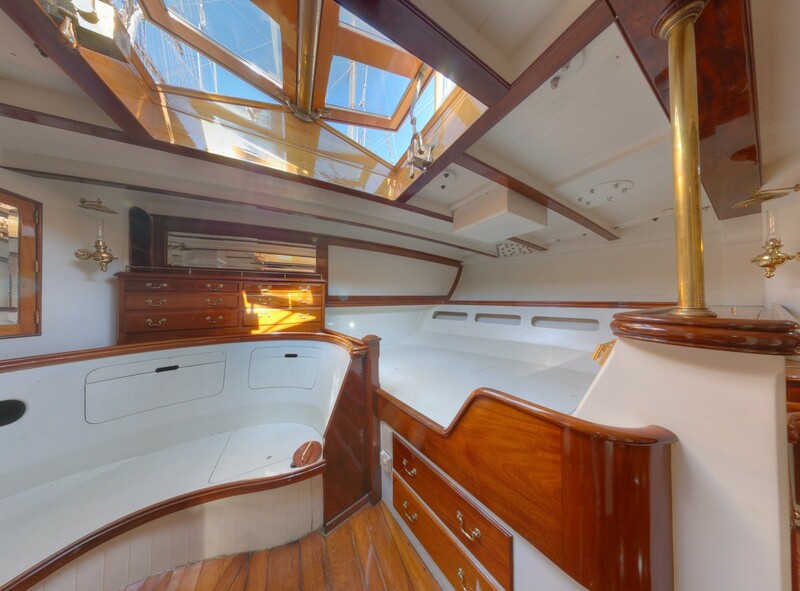 The yachts 6.2m (20.7ft) beam and gorgeous lines, combined with her flush teak decks, are intriguing and classy, a certain head-turner of timeless elegance. 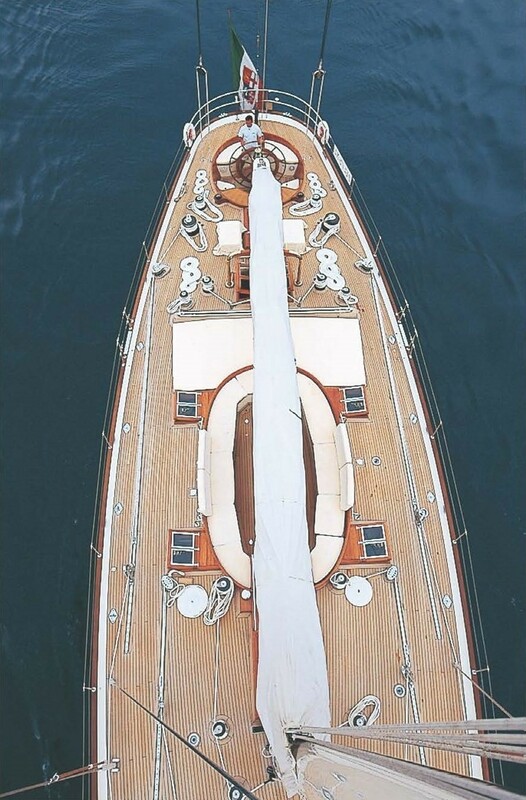 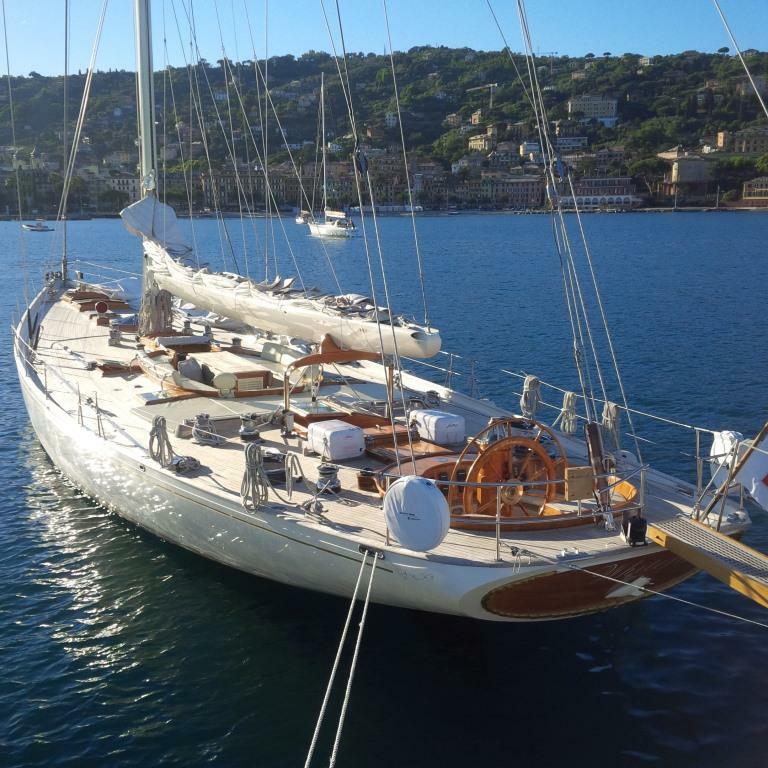 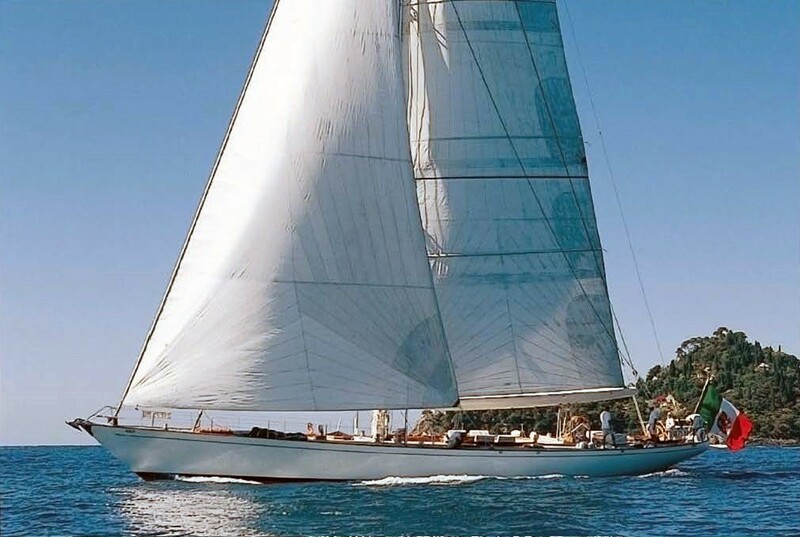 Her designer Bruce King is renowned for a number of spectacular classic maxi yachts, with ocean-going capabilities. 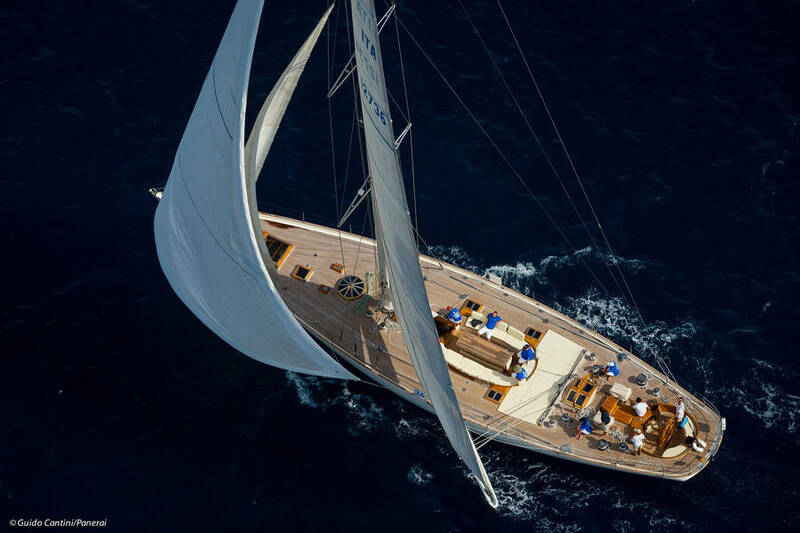 Sailing yacht WHITEFIN is no exception, with her West System advanced hull design, of cold-moulded cedar and impregnated Epoxy, she is agile and fast. 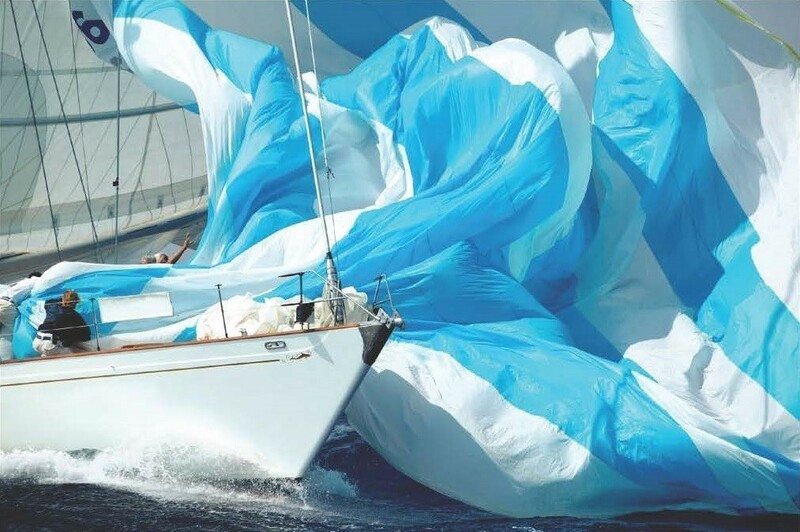 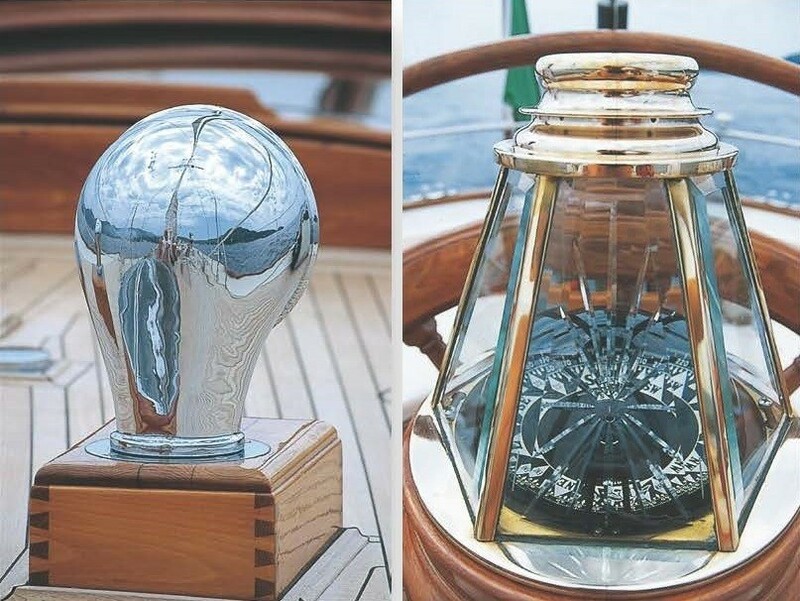 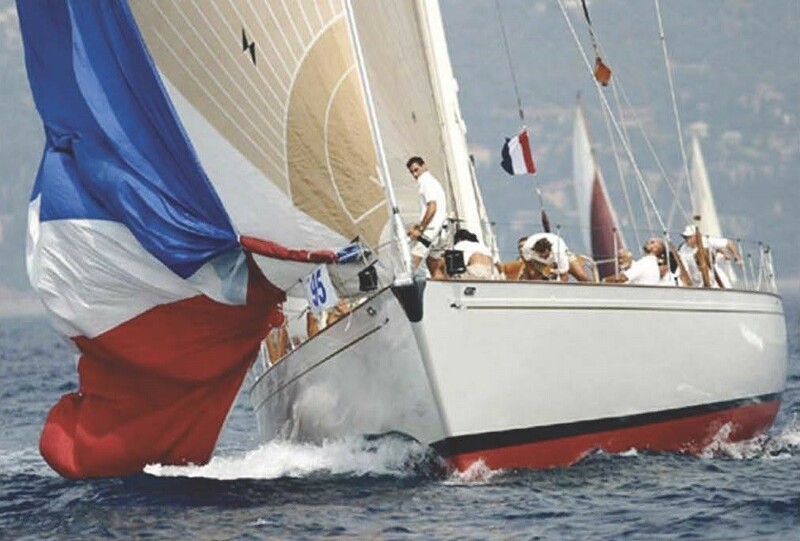 WHITEFIN boasts a victorious sailing history, with top finishes in some of the World’s most prestigious yachting races. 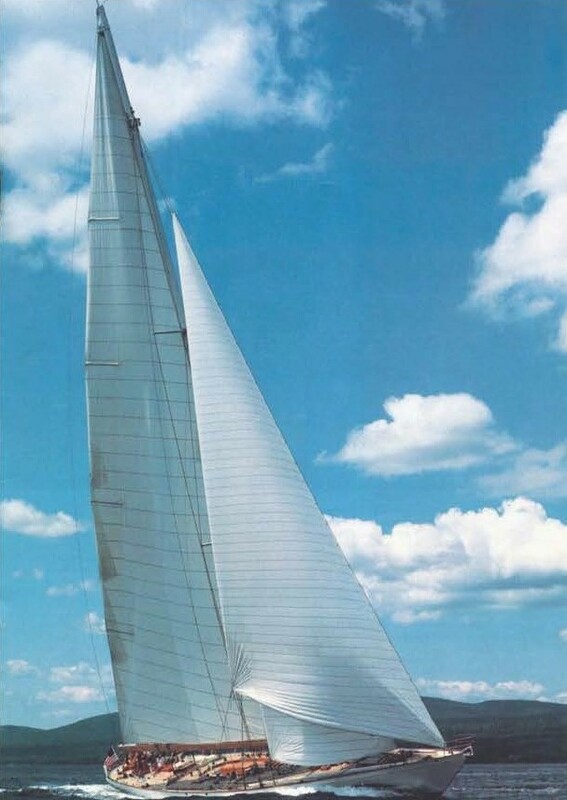 Sloop rigged WHITEFIN is powered by a Cummins 315hp engine when not under sail. 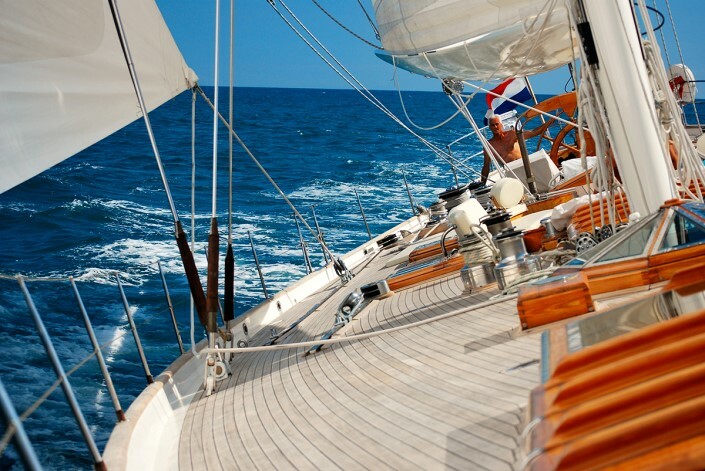 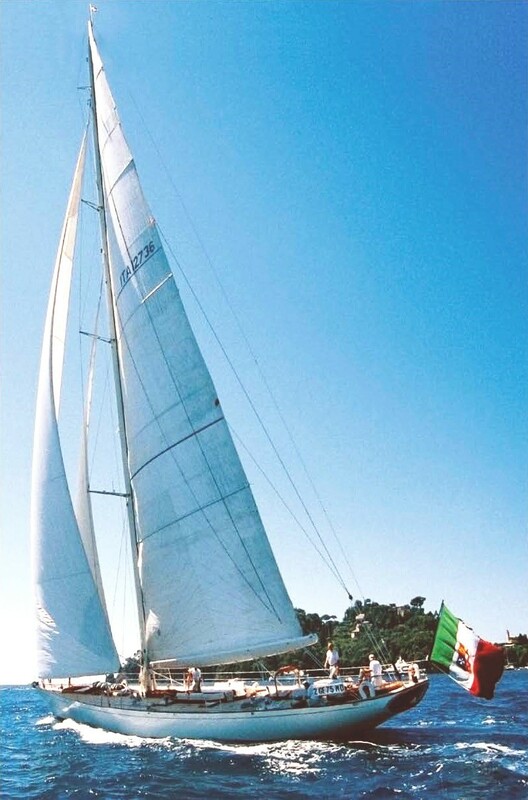 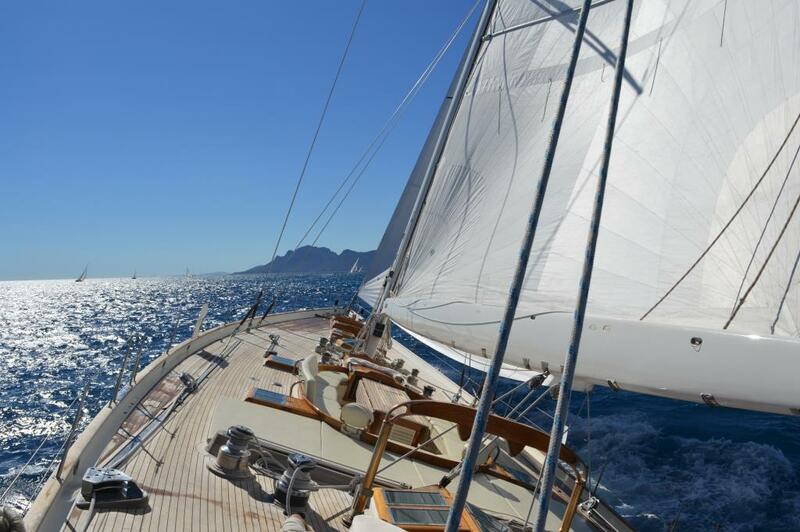 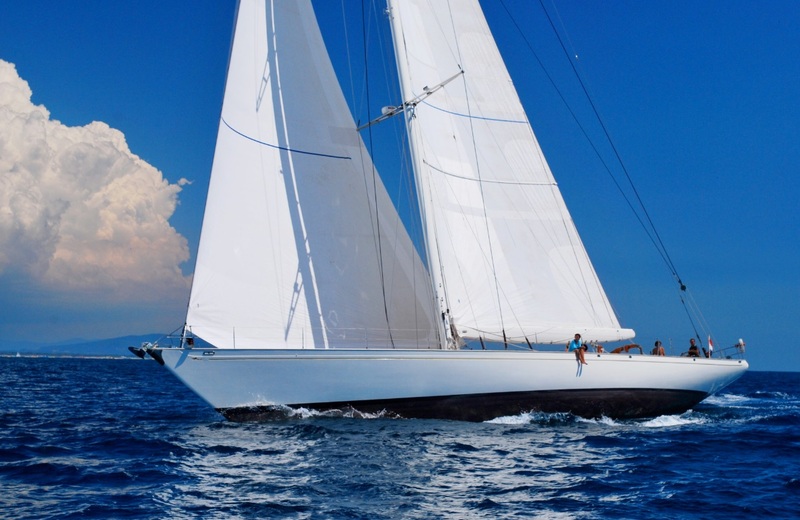 S/Y WHITEFIN cruises at 10 knots and can reach top speeds of a remarkable 15 knots. 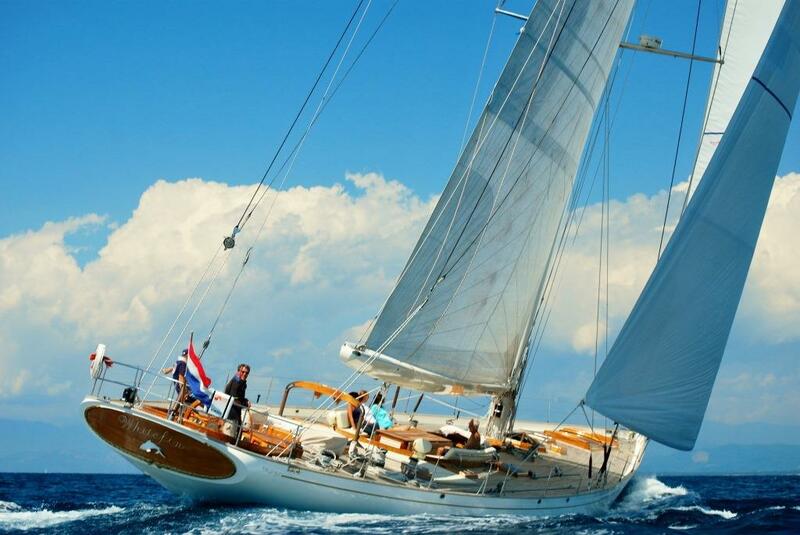 Luxury sailing yacht WHITEFIN offers accommodation in 4 cabins, for up to 8 yacht charter guests. 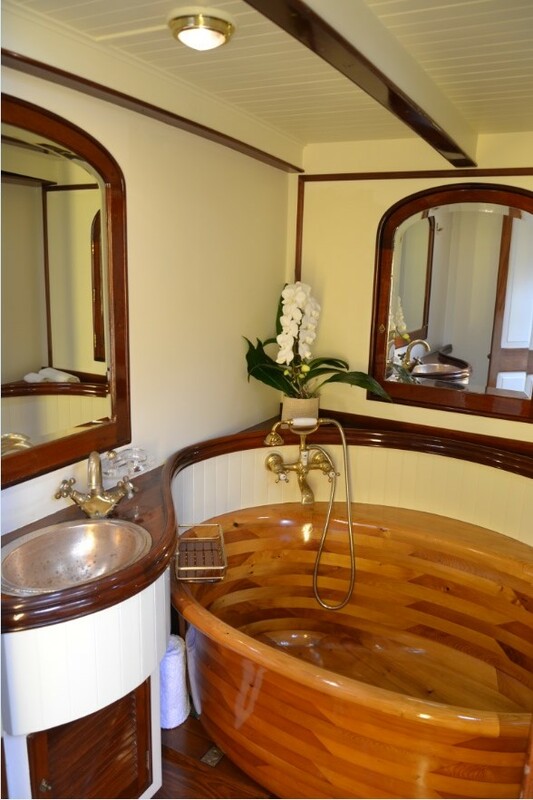 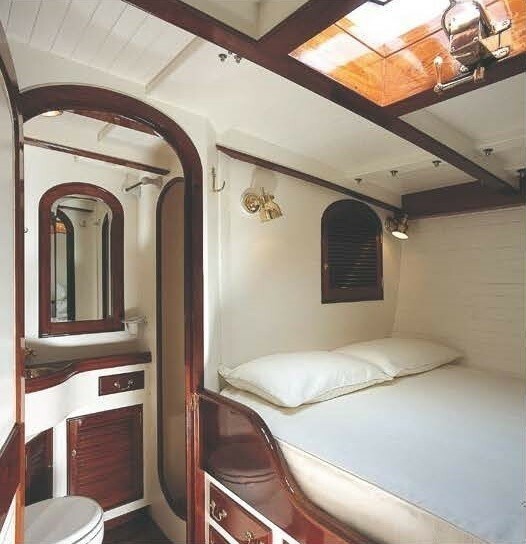 The master stateroom is aft and full beam of the yacht, with a double bed, vanity, sofa and en-suite, which includes a bespoke wooden tub. 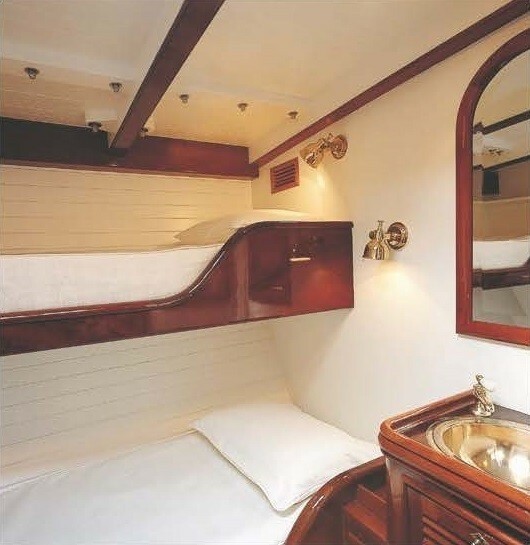 A VIP cabin is starboard and forward of the master cabin, with a double bed and en-suite facilities. 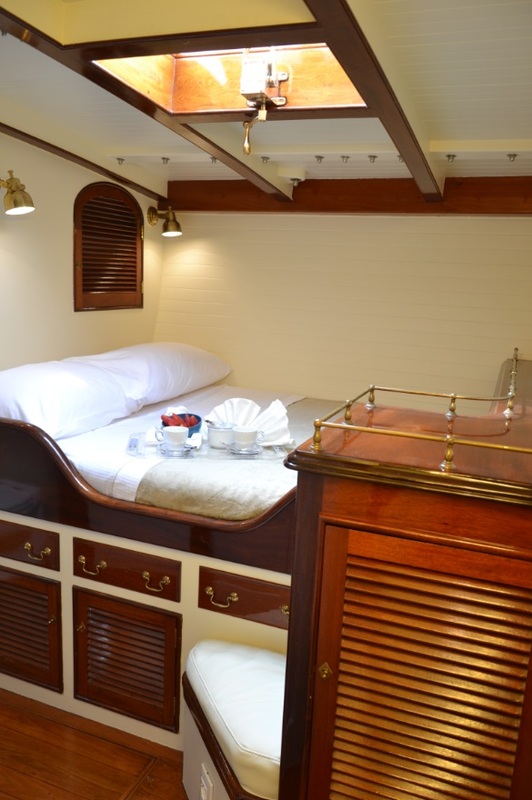 Two guest cabins are to port, with upper and lower twin beds and shared facilities. 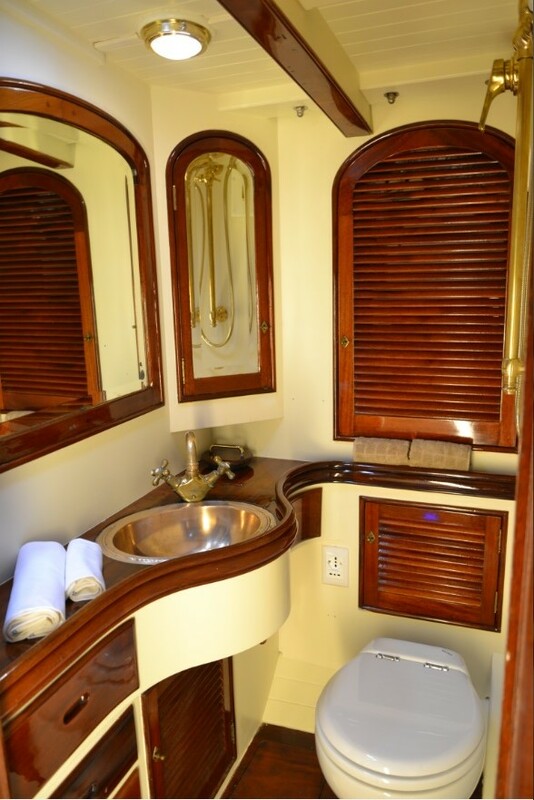 A professional crew of 4 has private quarters forward of the yacht. 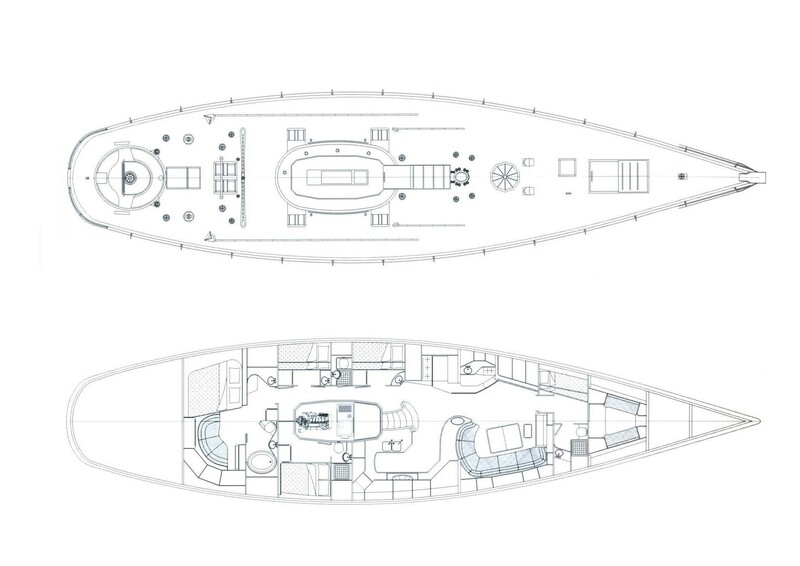 Tenders & Toys onboard the WHITEFIN sailing yacht include an Inflatable tender 4,5mt + 40hp outboard engine, Water ski, Towed tube, Snorkel equipment, Audio Visual Equipment and Deck Facilities include 40" LCD SMART TV connected to the Raymarine navigation multifunctional display for guest updating on routing & navigation. 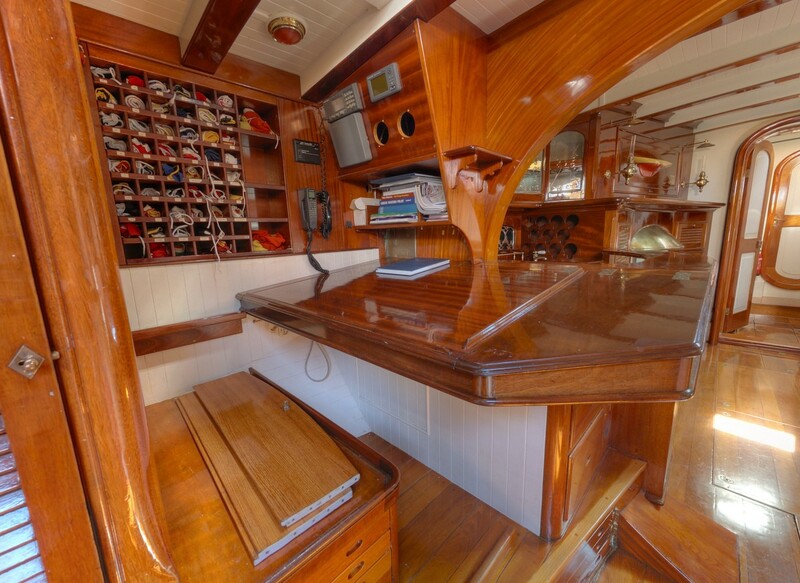 Connected to the on board Internet shot spot, Stereo and Film player connected to the TV with USB port for music and video files, Bluetooth interface for any Smartphone & Tablet Apple and Android, Apple TV, for shearing of multimedia files between Apple devices and the Smart TV, Internet GPRS Router for on board hot spot.